Loom and unfinished blanket, Pima. Collected by Edward Palmer in Arizona in 1885. Department of Anthropology, National Museum of Natural History, Smithsonian Institution, cat. no. E076008; no accession number. Dimensions: The unfinished blanket measures 41 in. (warp) x 22.5 in. (weft). The loom bars, made of cactus, are 56 in. long and 2.3 in. in diameter. The entire loom is 45 in. long. Thread count: Warp = 8/in. 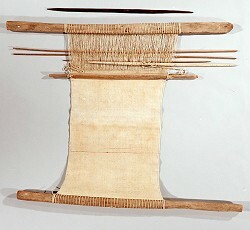 ; Weft = 11/in. Fibers: Warp and weft = 1-ply cotton yarn, white, Z-spin. Two red wefts of wool. 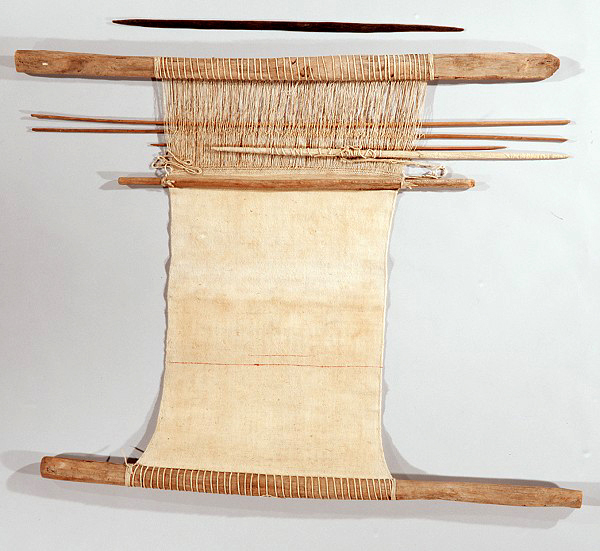 Design: Other than the inclusion of two red threads in the weft, there is no design elaboration.